Eight months into his presidency, Obama might want to give Moses a second look. On issues from health care to Afghanistan, the President faces doubts and rebellions, from an entrenched pharaonic establishment on one hand and restless, stiff-necked followers on the other. There's good reason, then, for Obama to heed the leadership lessons of history's greatest leader. Like presidential predecessors from Washington to Reagan, Obama can use the Moses story to help guide Americans in troubled times. 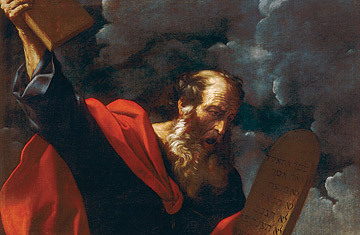 From the Pilgrims to the Founding Fathers, the Civil War to the civil rights movement, Americans have turned to Moses in periods of crisis because his narrative offers a road map of peril and promise. The plight of the Israelites resonated with the earliest American settlers. For centuries, the Catholic Church had banned the direct reading of Scripture. But the Protestant Reformation, combined with the printing press, brought vernacular Bibles to everyday readers. What Protestants discovered was a narrative that reminded them of their sense of subjugation by the church and appealed to their dreams of a Utopian New World. The Pilgrims stressed this aspect of Moses. When the band of Protestant breakaways left England in 1620, they described themselves as the chosen people fleeing their pharaoh, King James. On the Atlantic, they proclaimed their journey to be as vital as "Moses and the Israelites when they went out of Egypt." And when they got to Cape Cod, they thanked God for letting them pass through their fiery Red Sea.